It’s not every man whose wife criticizes his fidelity, but Jacob Christianson hasn’t exactly led a typical life. Raised in a conservative polygamous sect, Jacob has struggled for years to reconcile his faith with his skepticism about the fundamentalist practices of his community. Not so long ago that conflict helped Jacob to combat a dangerous faction of his own church. Now it has brought the FBI to his door, seeking help to infiltrate a millennialist cult suspected of plotting to kill a US senator. When the FBI ignores Jacob’s warnings, it sparks a dramatic standoff with the cultists, leaving Jacob and his family caught squarely in the middle. 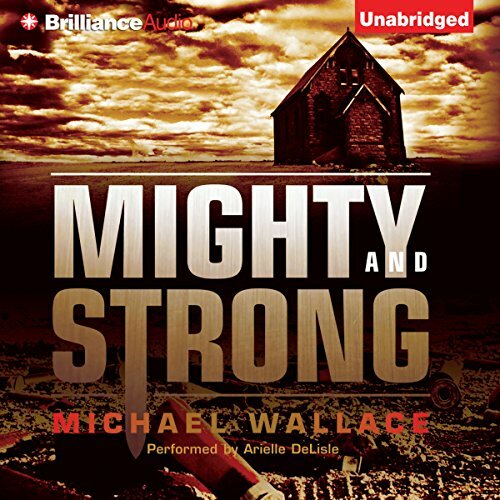 Tense and engaging, Mighty and Strong is a page-turning foray into the world of religious extremists, culminating in a thrilling battle for supremacy that will leave no one unscathed. ©2012 Michael Wallace (P)2012 Brilliance Audio, Inc. Listen to this one, it's something differenet! Jacob is a resident at a hospital with a wife and 3 children. But Jacob has a secret, he comes from a polygamist family. Jacob does not hold the same beliefs. And then the F.B.I. comes calling for his help. He agrees do become an informant. While doing his civic duty, his wife gets thrown out on the streets, the senator is after his(Jacob) family. Now Jacob has to pick up the pieces of his life. The story is about Mormon polygamists, Mormon non- polygamists, a murder, and a man calling himself a prophet. The narrator did a good job with the story. The book was suspenseful, and educational. If your looking for something different, I suggest the Might and Strong.